The International Sanctions Compliance Assessment is a requirement of the Higher Degree by Research admission process. Individuals who are Australian citizens, permanent residents or holders of Australian humanitarian visas do not require assessment. If it is applicable, the International Sanctions Compliance Assessment form will be included in the combined admission assessment pack to be assessed by the relevant School and Faculty. The form is to be completed by the nominated supervisor and Head of School/nominee, and must be signed off by both. The assessment is undertaken using resources provided by DFAT and where a link is identified, the application will be further considered by the Faculty Pro Vice-Chancellor. If the Faculty Pro Vice-Chancellor supports the application, the application must be referred to the PVC (Research and Innovation) for approval. These restrict financial transactions and prohibits supply of military or strategic goods and services (including technology transfer, technical assistance or advice and dual use goods) to a sanctioned country or designated person. Whether the service (i.e. the University providing technical assistance, training or advice) is related to the manufacture or use of ‘export sanctioned goods’ (including dual-use goods). There is no single list of controlled goods that applies to all sanctioned countries. 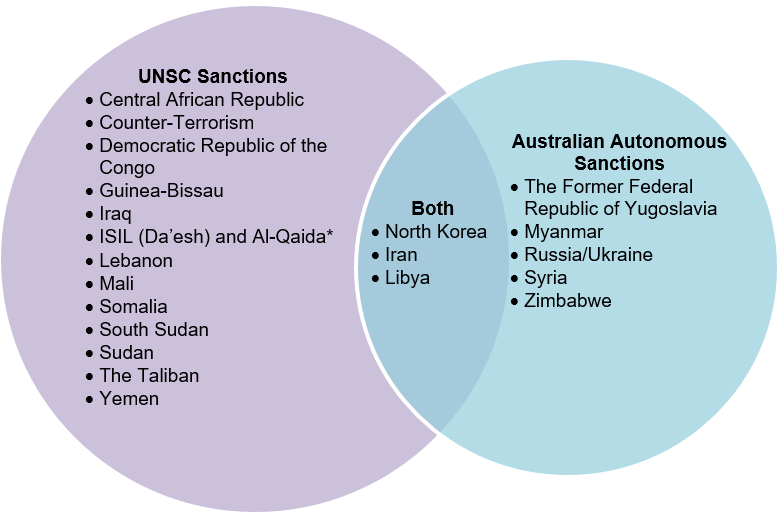 Australian law gives effect to a variety of export control regimes including those related to ‘arms and related materiel’ in the Charter of the United Nations. To assist with assessment, DFAT has indicated that the Defence and Strategic Goods list (DSGL) may be used as a proxy, in the first instance, for a comprehensive controlled goods list. For individuals there is a maximum of 10 years imprisonment or a maximum fine that is three times greater than the value of the transaction in breach of the sanction (if this can be calculated) or $475,000. For corporations, the penalty is either $1.7 million or three times the transaction value (whichever is higher). The entry into or transit through Australia of a ‘designated person’ or a ‘declared person’. Arms or Arms Related Materiel Weapons, ammunition, military vehicles and equipment, spare parts or accessories, and paramilitary equipment. Includes an asset or property of any kind, whether tangible or intangible, movable or immovable. Basic Scientific Research Experimental or theoretical work undertaken principally to acquire new knowledge of the fundamental principles of phenomena or observable facts, not primarily directed towards a specific practical aim or objective. DFAT considers training that constitutes ‘basic scientific research’ to be insufficiently specialised to constitute technical training. Consolidated List A list of all persons and entities subject to targeted financial sanctions or travel bans under Australian sanction laws. The list is maintained by DFAT. Controlled Asset/Good An asset/good owned or controlled by a designated person or entity. b) Designate a person or entity as a designated person or entity if the Minister is satisfied that the person or entity is contributing to the proliferation of weapons of mass destruction. Declared Person A person who is declared by the Minister for the purpose of preventing the person from travelling to, entering or remaining in Australia if the Minister is satisfied that the person is contributing to the proliferation of weapons of mass destruction. Export Sanctioned Goods Any goods listed as being sanctioned for a nominated sanctioned country, which means it is prohibited to provide services such as education or training in the manufacture, maintenance or use of the listed good. Sanctioned Country or Regime A country or regime that is subject to sanctions imposed under the Charter of the United Nations Act or the Autonomous Sanctions Act. Sanctioned Service Includes the provision to a person of technical advice, assistance or training if it assists with, or is provided in relation to, a sanctioned supply. Specified Entities Entities specified by the Minister either because they have links to Iran’s prohibited activities, or because they operate in sectors of Iran’s economy that the UNSC has identified as having the potential to contribute to Iran’s prohibited activities. Visitor A person hosted at a University of Newcastle campus from another Australian or international university, or another level of education, research organisation or industry to undertake one of the following activities: research; delivering workshops; presenting lectures; participating in a conference; sharing knowledge and information; attending meetings; observing University activities; providing consultancy services.